Our “hills are alive with the sound of music,” at least where we live in picturesque Port Angeles, Washington, gateway to Olympic National Park. It’s an idyllic setting, this Julie Andrews landscape. For my wife of thirty years, Deborah, and me, home is a cozy, two-story house, nestled amongst the heavily-forested foothills of Mt. Angeles, overlooking the vast, formidable Straits of San Juan De Fuca, which separate us from British Columbia. In a manner of moments, we can walk with our dogs on a wind-swept beach or hike through the mountains in total isolation. A stream runs along the entire eastern perimeter of our large, rectangular property, thus helping fence in three exuberant dogs—two Dalmatians, Dominique and Zoë, and Kindrah, a German shepherd, all of them rescues. Further privacy is afforded on three sides by large stands of fir and fast-growing alder, which in the summer become a dense package of impenetrable green and, in winter, a snow-frosted wonderland. In either event, “hunkered down” frequently comes to mind when I look out the window while working in my home office. Until recently, Port Angeles was such a small, isolated community that making a living proved difficult, if not impossible, especially for outsiders. When we moved here in 1980, only an intense enthusiasm for the area sustained us while we made the necessary economic adjustments. It was when we purchased a local record store (before the advent of CD's) the following year that our roots took hold in one of the most naturally beautiful areas in the country. At the core, Deborah and I are entrepreneurs, so it was not surprising that eventually we would branch out into several different ventures. However, always at the heart of each enterprise was my innate ability to connect with people. Customers frequently came to me for advice and, with little encouragement, often provided the most intimate details of their lives. Selling a product or service would just as likely include some counseling, coaching, or mentoring. In addition, other small-business owners would frequently confer with me about the challenges they faced. I learned from these relationships about the drama that surrounds people who want to lead lives of value and meaning but have no satisfactory solutions for doing so. Therefore, one day early in 2005 when a close friend reminded me of these things and suggested that I consider a career in the relatively new but very appropriate field of coaching, I took her up on it and enrolled in courses at Coach U. Since integrating coaching ideas and methods into my daily life, I’ve never been healthier, happier, or more self-confident. 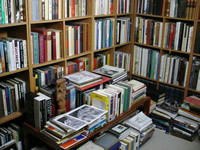 There has always existed within my wife and me a passionate eagerness to read and to collect books. It would be safe to say, with an exceptionally healthy conscience, that books control our lives and illuminate our days, that our home is a flourishing, literary landscape which we seldom wish to leave. We love all books, not just for the writing inside but very often for how they look, feel, and resonate. Even size and weight count. What nature of small treasure exists in every volume? What manner of Holy Grail beckons from the most obscure title? There is a full complement of books in the kitchen, probably where pots and pans should reside. There isn’t a TV in the living room, better for additional book storage. Bedrooms, bathrooms, and the office overflow with books and magazines, as does the garage where years have passed since our van called the place home. The only thing noticeably absent is space, long ago devoured by our insatiable literary appetites. This is the place we call home, the environment from which I coach, the atmosphere with which I willingly and joyously surround myself. When I think of my relationship to the world, to ideas, to a sense of self-identity, I view it through the opportunistic eyes of an imaginative businessperson. For over thirty years I have used this awareness in a variety of small, successful, family-owned enterprises: retailing, printing, network marketing, newsletter publication, the sale of used and rare books, fine art photography, teaching, and coaching. My vision is always centered upon key principals and ideas—a view of the world not merely as it is, but as I could improve upon it. I work to satisfy my individual goals, needs, and aspirations. I work to know myself better and to discover new talent and aptitudes. I work to solve problems, to overcome adversity, and to push the constraints of time and economy. Through all the choices I make, the risks I take, and the success or failure that occurs, one thing is for certain—there is no greater experience for an entrepreneur than giving birth to an economic entity. To see my résumé, click here. For over twenty years, I worked in the medium of fine art photography, which incorporated exhibiting internationally, teaching dozens of classes, and conducting many workshops. In addition, Deborah and I were assistant instructors for three consecutive years at the famed Ansel Adams photography workshops in Yosemite and Carmel, California. These experiences in photography and, more recently, with drawing and writing, have led to an increased awareness of some of the many trials and pitfalls that accompany an act of personal expression. Art represents a different set of connections from my entrepreneurial pursuits but shows that one’s consciousness knows no bounds. The shaping and improvement of my analytical skills I attribute to business. The demonstration of the range of human potential and capabilities I acknowledge from the world of artistic achievement. Ironically, both require skill in organizing and integrating ideas. When merged together and when used effectively, they can provide many answers to the questions we face in life.